With the continuous need to brand and market businesses at an all time high, business owners are continually in search of an incredible means of marketing their business. Well, thanks to car wraps, businesses now have a smart way to advertise their business and yes, at an affordable price too. So, if you’re looking for an incredible way to advertise your business without digging a fat hole into your finances, leveraging car wraps is a step in the right direction. So, what is a car wrap and why is it so special for advertising? Well, we are glad you asked. Read on and you wouldn’t be disappointed you did. Car wrap for advertising is an ingenious way of advertising your business and guess what? It involves partially or completely wrapping your car with your preferred advertising campaigns. Unlike standard billboards, car wrap is completely mobile. This means you can advertise your business and take it to places where standard billboards cannot reach. By leveraging this advertising medium, you’ll easily put your business in the faces of intending customers. With car wraps, you can advertise your business even if you’re caught in the traffic. Like we said earlier, car wrap is an awesome way to advertise your business. This isn’t surprising especially seeing that it is cost effective. This makes it absolutely perfect for businesses on a budget. The exciting thing is that this incredible advertising technique can last up to five years. This means after paying the initial cost of wrapping your vehicle, you wouldn’t have to pay again to wrap your car for the next five years; awesome right? When compared to other forms of advertisement like TV or radio commercial, you’ll agree that car wrap is absolutely worth it and affordable too. With car wrap, you can enjoy all that exposure you have always craved looked out for. Want to put your business where it belongs? Then car wraps should be one advertising medium you should be looking to. With car wraps, you can completely win your neighborhood over. The best way to inform the public of your presence is to put your business in the faces of your target audience, and what better way can you do this than leveraging car wraps? Looking for an opportunity to market your business round the clock? Then vehicle wrap suits your business quite perfectly. With vehicle wrap, you can advertise your business 24 hours a day without breaking the bank. Whether you’re driving through town or stuck in traffic or a parking lot, vehicle wrap always do your biddings no matter the time of the day. 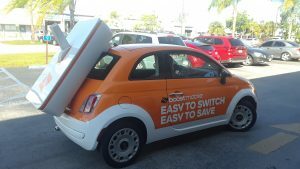 Just recently, Boost mobile contacted Vibrant Sign Studio to provide car wrappings for their fleet of cars and guess what? The job was so perfect; the company fell instantly in love with the idea. Well, you too can give car wrapping a try and thank us later. One thing is certain, car wraps will take your business to the next level. Below is a glimpse of what we did. Their fleet of vehicles was wrapped using 3M cast vinyl printed to match their pantone color and overlaminated with a 3M cast overlaminate. 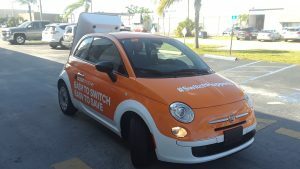 The Switch was provided by our customer, this is because it blends perfectly with their marketing campaign. Are you looking for a Custom Car Wrap? Contact us for a free estimate. We are located in Miami, FL. Written by: Vibrant Sign Studio, Miami, FL.